Previously published on Em’s Museums Musings. This past summer, I spent the day exploring London with my Mum; looking around Borough Market, eating lots of Thai Food and visiting the Votes for Women display at Museum of London. My mum is undoubtedly the strongest, most hard-working and courageous woman I know and so I felt anything related to women’s rights and suffrage would be perfect. 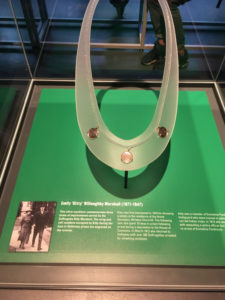 Emily ‘Kitty’ Willoughby Marshall’s silver necklace engraved with the dates of her imprisonment. Photo Credit: Emily Clarke. 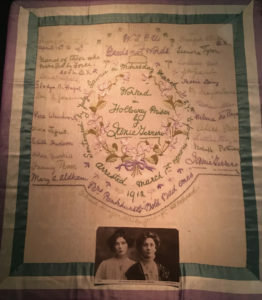 Suffragette panel, Janie Terrero, 1912, displayed at the Museum of London. Photo Credit: Emily Clarke. 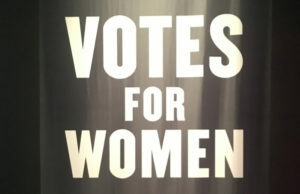 Perhaps following the suffragette’s motto of ‘Deeds Not Words’ would be a good start for the sector.